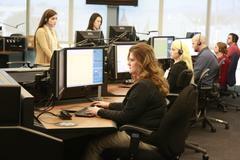 24 hours per day, seven days a week, Sheriff's Dispatchers answer emergency calls from all across San Diego County. They save lives by getting help out to those calling 9-1-1. As an Emergency Services Dispatcher Trainee, you will respond to 9-1-1 emergency and non-emergency calls and be responsible for dispatching deputies in the field. Candidates must be 18 years of age and have effective oral and written communication skills in English. All candidates must pass the Criti-Call performance test as administered by the County of San Diego.